The share of corporate bond issuers with the lowest investment grade rating - BBB and equivalent - has risen in the United States and Europe since 2000 (Graph B, first panel). In the United States, the increase took place mainly prior to the Great Financial Crisis (GFC). In Europe, it continued after the GFC. As of 2018, the share of corporate bond issuers rated BBB stood at about one third in the United States and at nearly half in Europe. Rating-based investment mandates require portfolio managers to hold assets above a minimum credit quality. Such mandates often apply to corporate bond mutual funds, and allow investors to easily choose the desired risk exposure, often focusing on the investment grade segment. Since the GFC, investment grade corporate bond mutual funds have steadily increased the share of BBB bonds in their portfolios. In 2018, this share stood at about 45% in both the United States and Europe, up from roughly 20% in 2010 (Graph B, second panel). 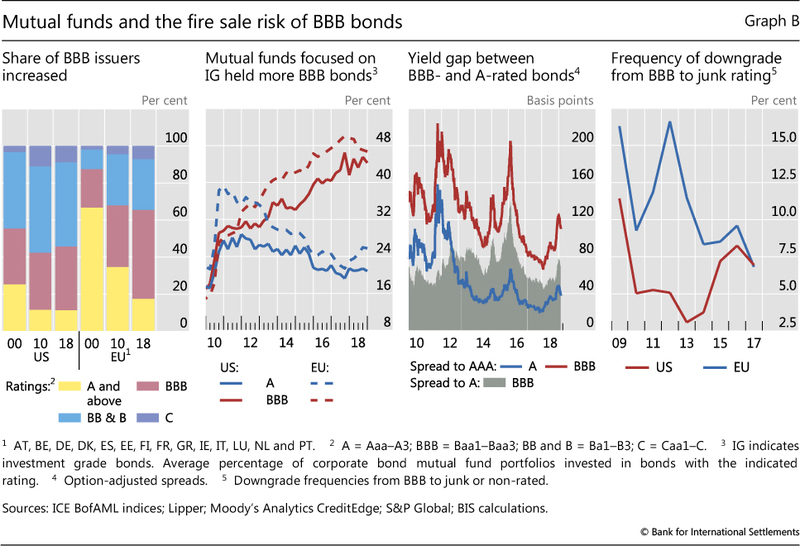 As interest rates remained unusually low post-GFC, portfolio managers were enticed by the significant yield offered by BBB-rated bonds, which was substantially higher than for better-rated bonds (third panel). While attractive to investors that seek a targeted risk exposure, rating-based investment mandates can lead to fire sales. If, on the heels of economic weakness, enough issuers were abruptly downgraded from BBB to junk status, mutual funds and, more broadly, other market participants with investment grade mandates could be forced to offload large amounts of bonds quickly. 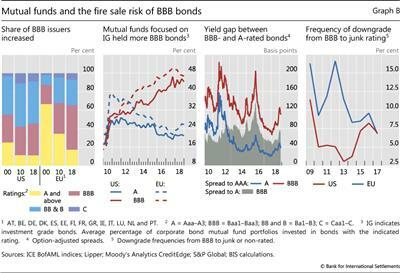 The odds of such fire sales depend on the likelihood that a sufficiently large number of companies are downgraded from BBB to junk status in short order. In 2009, when default rates reached record highs, the frequency of such downgrades was 11.4% in the United States and 16.3% in Europe (Graph B, fourth panel). By 2017, this frequency had fallen to around 7% in both regions. Under reasonable assumptions, a return to 2009 downgrade rates could force portfolio rebalancing in excess of daily turnover in corporate bond markets. According to the Securities Industry and Financial Markets Association, about $9,100 billion of US corporate bonds were outstanding as of Q3 2018, with a daily trading volume of about $25 billion (0.27% turnover). With an 11.4% BBB-to-junk downgrade frequency, assuming 10% of the downgrades occurred around the same time and that one third of the bonds were offloaded quickly, about 0.38% of outstanding BBB bonds would be sold (compared with 0.27% daily turnover).